You might think that since this is a homemaking blog, most of the questions I receive from readers are about homemaking. You know, questions like how to keep up with laundry, how to keep healthy meals on the table, or learning to mother teenagers. But those don’t make up the majority of the questions I receive. 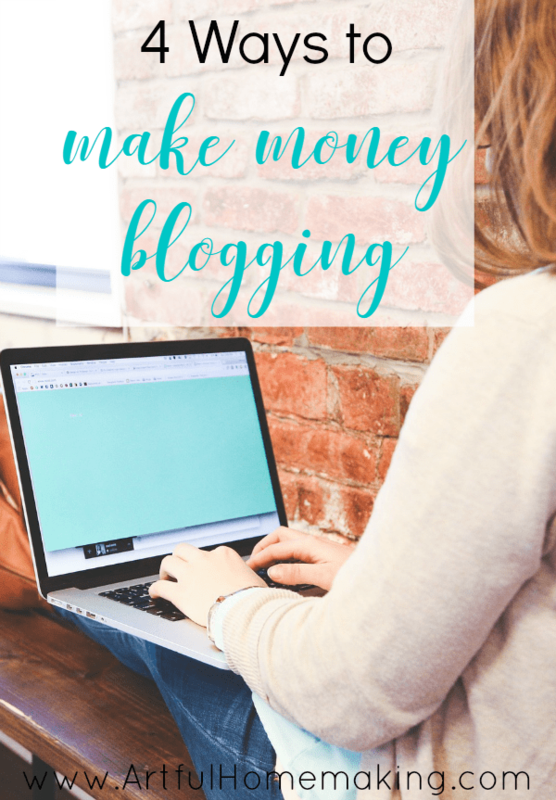 The most frequently asked questions are about blogging and making money. I guess it’s because many of us are struggling to make ends meet on one income. Many of us are trying to get out of debt or trying save for something like a reliable vehicle or music lessons for our children. Blogging is one way to make an income from home. I’ll be honest, it’s not easy. But it can be done! 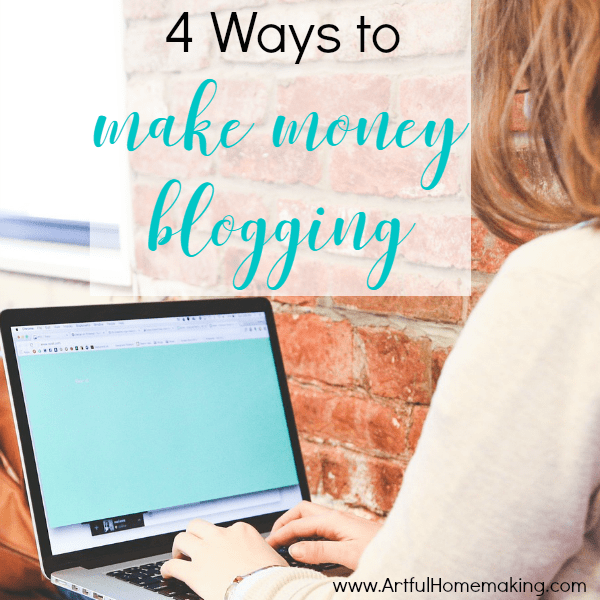 In this post, I’ll share four ways you can make money with your blog. And I’m assuming that you already have a blog that you’re trying to monetize. If you need help starting a blog, let me know, and I can cover that topic in another post. One of the simplest and most common ways to make money with a blog is to sell ad space. You can either work with an ad network (like Google Adsense) or sell private ads, working directly with the company. I started out by offering sidebar space to smaller companies, and then branched out with Google Adsense. Some bloggers feel uncomfortable about putting ads on their site, and there is the concern of losing the warm and friendly atmosphere because of the ads. I understand completely, because I also worried about this at first. I would definitely prefer to not need ads on my site, but it has become one of my necessary income streams and helps to keep the blog running! A sponsored post is a post that you’ve been paid to write for a company. This gets the company more exposure for their product. I have only done one sponsored post (on my Facebook page) so far, so this hasn’t been extremely profitable for me at this point. One of the downsides to sponsored posts is that they often take a lot of time to put together, since the company has certain guidelines that have to be followed and everything has to be done a certain way. That’s the main reason I haven’t pursued this yet. There’s just not enough time! Some of the most popular sponsored post companies are: Izea, TapInfluence, and Social Fabric. So far I only have experience with TapInfluence. Whenever you find a product that you love, see if there’s an affiliate program for it. If there is, join the affiliate program and use your affiliate link whenever you write about that product. Whenever someone makes a purchase through your link, you’ll be paid a percentage of the sale. Probably the most popular affiliate program is the one offered by Amazon. And for good reason. If someone clicks through your link and makes a purchase, you’ll get paid a small percentage of the sale, regardless of what they order! And who doesn’t shop at Amazon! I enjoyed being an Amazon affiliate for several years back when I first started blogging. But then my state passed a law that prohibited everyone in my state from being an affiliate. If your state isn’t on the banned list, definitely look into their affiliate program! Even if you’re not able to do Amazon, you can still find affiliate programs to join that will pay you a percentage of each sale that comes through your affiliate links. At this point, affiliate programs are my favorite way to make money blogging. I love recommending truly useful products to my readers! If I had the time, selling my own products would definitely be my favorite way to monetize my blog, and it’s something I’m hoping to pursue in the future. You can sell digital products as well as physical products. One huge benefit of digital products is that you don’t have a physical product to store, package up, and mail. Online courses are extremely popular right now. If you have expertise in a certain area and have the time to set up an eCourse, it’s probably the most profitable digital product option. If you’re serious about taking your blog to the next level and making it work for you (getting paid to do something you love! ), this blogging course has been a game-changer for me. I wish I had taken it years ago! (The course is closed right now, but it’s worth it to get on the waiting list so you’ll be notified when it reopens. Plus, you can get a free book, 7 Surefire Ways to Boost Your Blog Income Overnight, just for signing up for the waiting list!) Sign up and get your free eBook here. Disclosure: This post contains my affiliate links. Read my full disclosure here.